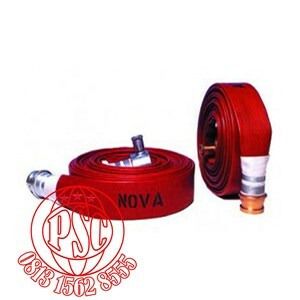 Delta Nova is a high quality layflat Fire Hose used by Marine & Industrial professionals around the world. Designed to withstand use in harsh environments Nova lends itself perfectly to Off-Shore Operators for use on Platforms, Drilling Rigs, FPSO’s and all marine based applications. Also ideally suited for the Waste & Recycling sectors due to its chemical and abrasion resistant properties Nova is also widely used by a broad range of Industrial users. Constructed with a synthetic woven textile reinforcement encased in high tensile PVC/Nitrile rubber forming a unified lining and cover Nova is manufactured to BS6391 and is Lloyds Register Approved. Available in a choice of lengths, diameters and colours Nova can be supplied with any British or International couplings (light alloy or gunmetal) for compatibility to existing equipment. Large stockholding ensure fast deliveries and meeting time-sensitive requirements.